What You Need To Know For Booking Group Sessions: How to Request, Invite Other Students, and Start a Group Session as a Knack student-user. Group Sessions are a great way to supercharge your studying. Invite a Knack Tutor to lead your study groups, and ensure you're on the right track: they'll help you and your classmates review for an upcoming exam, quiz, assignment, or project. Pro Tip: Hit "Share Invite Link" and continue to rack up discounts as additional students accept / join the session! Copy/paste the link to your LMS portal, Facebook Groups, GroupMe, etc. And Remember, if you’re inviting a non-Knack user, send your referral code along with the group session invite and everyone will earn a $20 discount! Welcome to the better way of studying! As you browse tutors, look for the purple Groups badge on their profile(s). When you open a request form, you’ll notice a “Students” section, press "Invite Students". From there you can search by name and invite existing Knack Users and/or Contacts from your device's address book. Once your request is sent to your tutor, each student will receive a notification to accept/decline the group session invite. You'll be labeled as the "Organizer" and Group discounts will begin to apply as invited students accept their invites. Please Note: Only you, as the Organizer, and your requested tutor can invite students to the session. The Group Session details and the potential estimated cost for new students will be viewable by those with the link, and students may directly join from the link. See a preview below! And Remember, if you’re inviting a non-Knack user, send your referral code along when you share the invite link and everyone will earn a $20 discount! 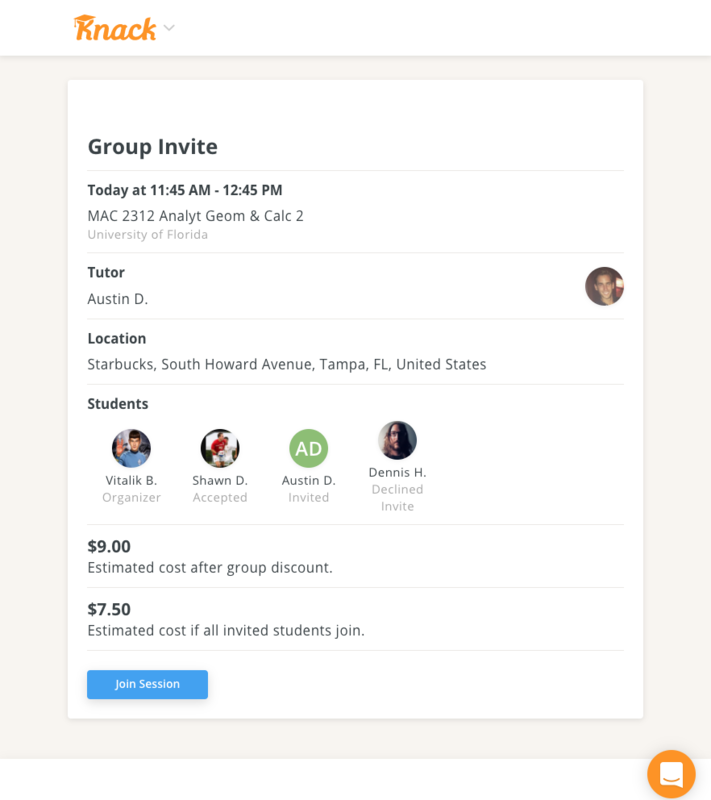 Students must “Accept” their group session invites in order for everyone to earn discounts. Invited students may leave the session up until the start time. When all accepted students and the tutor are present, the organizing student and tutor will both press start on the timer to begin the session. Once your group is ready to end the session, either the organizer or the tutor will simply press “End”.